View More In Single Homeopathic Remedies. Formulated for symptoms associated with bites and stings such as pain, burning, itching and swelling. Directions: Ages 12 and up, take 6 drops or pellets by mouth (ages 0 to 11, give 3 drops or pellets) as needed or as directed by a health professional. Under age 2, crush or dissolve pellets in purified water. Sensitive persons begin with 1 drop or pellet and gradually increase to full dose. 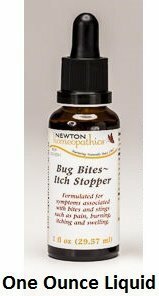 If you have any questions about this product by Newton Homeopathics, contact us by completing and submitting the form below. If you are looking for a specif part number, please include it with your message.